H Top Royal Star Hotel Girona is a modern family hotel boasting an excellent location in Lloret de Mar. The hotel is only a stone's throw from the beautiful Fenals beach. The lively resort, with its many restaurants, bars, pubs and entertainment venues, is a short walk away. The hotel features a spacious lobby with reception, lifts, restaurant, bar, lounge, TV room and a souvenir shop. 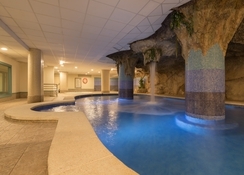 The hotel has a terrace with Jacuzzi, outdoor pool with children area, playground and garden. It offers a host of amenities like an indoor pool, a gymnasium, and a spa offering a host of treatments, massages and therapies. In the well-kept outdoor complex, you will find 2 freshwater swimming pools with sun terrace. The accommodation in this hotel offer spectacular views of the Mediterranean Sea. 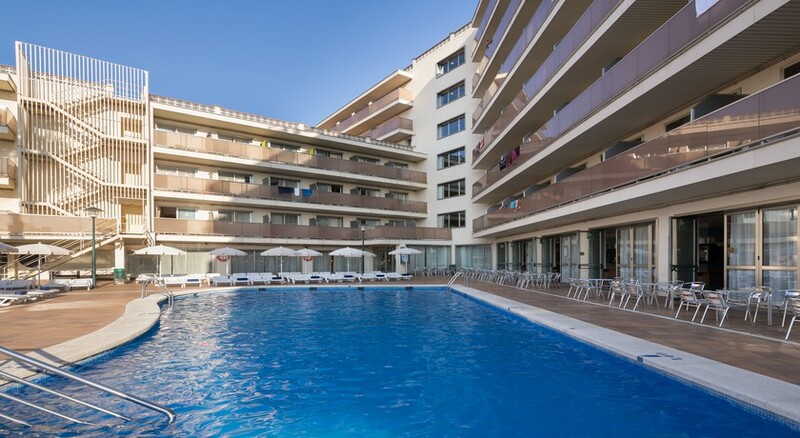 The H Top Royal Star Hotel Girona enjoys a beautiful location in Lloret de Mar. It is only 500m from the beach. The village centre with numerous shopping and entertainment venues is a few hundred metres from the hotel. The Girona Airport is about 28km from the hotel. From the Barcelona International Airport, the hotel is about 90km. Visitors can take a train from the Barcelona Airport, with transfer at Barcelona Sants. H Top Royal Star Hotel Girona offers 368 guestrooms. The rooms have a balcony and are equipped with satellite television, direct telephone. Bathrooms feature bidets, hair dryers, and complimentary toiletries. The rooms also have a sofa bed, air conditioning and welcome service. The hotel provides wake-up service. All meals of the day are offered in the form of a buffet. This hotel has all-inclusive options, which includes meals and drinks consumed at the hotel’s restaurants and bars. A supplement may be applied for eating in some restaurants, or for certain menus or dishes, drinks or other services. 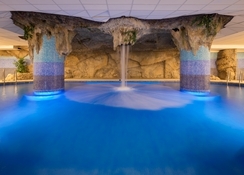 H Top Royal Star Hotel Girona has a wide range of activities (depending on the season) for your entertainment. Guests can choose from table tennis or billiards or spend time relaxing and rejuvenate at the hotel’s spa which features a heated indoor swimming pool, sauna, steam bath, fitness room and whirlpool. The hotel also features daytime and evening entertainment with live music and dancing. You can also use the Turkish bath or sweat in the sauna, indoor pool, sauna, Turkish bath, hammam, Jacuzzi, whirlpool and gym. Children of 5 – 12 years can have fun at the hotel’s kids' club. Here expert animation staff take care of entertainment for your children. I never leave reviews normally, but this Hotel really deliver. Went last year with my teenage sons for a week and I honestly say I have no complaints. WiFi isn’t free, as a heads up. I thoroughly enjoyed my stay at The Royal Star..I have been back 3 times now as it offers everything I require in a holicay. The hotel was clean and the staff friendly and the food was good and varied. I had a fantastic time at HTop hotel Costa blanca. The best thing was, everything was a walking distance. Beautiful shops and restaurants, gorgeous beach. Cannot fault. Lovely people at the property. Entertainment every night but a old fashioned. Good stay, nice food and good service. Gym could do with a makeover.